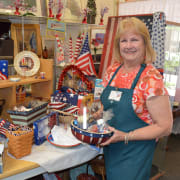 As a Novato Thrift Store Volunteer you’ll be helping to support our compassionate programs by receiving and preparing gently-used donated items and then re-selling them to customers in our Hodgepodge II Thrift Store. You’ll also enjoy being part of a retail team in a relaxed and friendly environment. On-site training is provided and days are flexible. Volunteer shifts are available Mondays-Saturdays: 9:30 a.m. - 1:00 p.m. OR 1:00 p.m. - 4:30 p.m. A commitment of one shift per week is desired.